While we wait on the finishing touches to be applied to the Q2 2007 release, let's take a closer look at one of the controls that is getting some big improvements this cycle. I briefly mentioned some of the new features coming to RadChart a couple of months ago, but I did not spend much time elaborating on the improvements. RadChart has been one of Telerik's key focuses since late 2006 and it is being aggressively improved and upgrade in every release cycle. It is still not a full-fledge 3D charting solution, but the rich set of business charting features in the control is rapidly expanding. But before I list the new major features, let me point out that the improvements being made to the Telerik charting engine are being shared across all Telerik product lines. That means improvements are seen in RadChart for ASP.NET, for WinForms, and in Telerik Reporting charts. The shared nature of the charting engine means that it is even easier for Telerik to improve your charting experience and make new features available wherever you need them. Expect the improvements to continue in Q3. One of my favorite new features. Intelligent labels are automatically positioned so that text does not overlap on the charts. Another personal favorite. 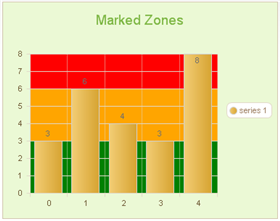 This feature is great for dashboard reporting as it allows you to easily color different ranges on the chart background. As you can see, the Charting team has been very busy. You can play with all of these new features in the "Prometheus" Futures online demos today and get ready to use them in your applications tomorrow! Not to forget the new Documentation for that big control, that got a major face lift and helpful samples.